Monozygotic twin sisters with optic glioma “in mirror image” (one with involvement of the left optic nerve and the other with the right optic nerve) and hydrocephalus secondary to progressive stenosis of the aqueduct have been found in a series of 128 cases below 14 years of age with neurofibromatosis. The optic glioma was diagnosed in each of the twins at 2 years of age. In one twin the tumor involved only the optic nerve but in the other the glioma affected the optic nerve and spread to the homolateral zone of the optic chiasm. 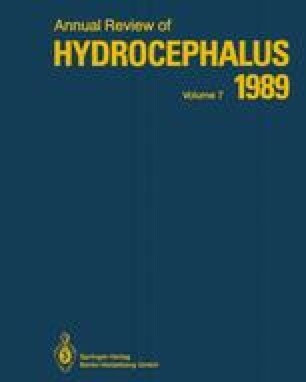 First symptoms of hydrocephalus appeared at 8 years and 11 years of age respectively but ventriculo-peritoneal shunting procedures were performed to relieve intracranial hypertension at 11 years and 15 years of age respectively. At 2 years of age both twins had pneumoencephalography which demonstrated normal air passage though the aqueduct and cerebral ventricles of normal size and morphology. Posterior studies with CT-scan demonstrated progressive obstruction of the hydrocephalus in each twin, although it was not observed simultaneously. The increased intracranial pressure was tolerated for many years in each twin without obvious symptoms which could be attributed to the slow progression of the aqueduct obstruction.